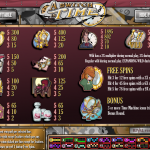 A Switch In Time is a 5 reels / 20 paylines slot game released in 2009 by Rival. The theme here is a very 19th century England like something coming out of H.G. Wells books and it will involve a time machine of course. 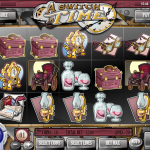 The Wild in this game is the Hourglass clock symbol which will substitute other symbol to create a winning combination. It will also come with a 2x multiplier and 3x multiplier during Free Spin rounds. Oh and it can also expand during free spins to help you get more wins. The second scatter is the Time Machine symbol. Landing 3 or more will trigger the Bonus Round in which you’ll be picking several buttons in the time machine. Each pick is worth a prize and will move the time needle towards the past. When the needles gets to the limit the bonus round is over but now you’ll be playing in the past! After that the only way to go back to your time is landing those 3 scatters again and play the feature all over again. This is an example of a great game that has both good graphics and a good story. 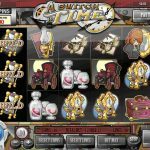 With the bonus features and the very generous free spins rounds you get what we consider an awesome game. If you’d like to know more about Chinese culture then you should consider playing Panda Party a 5 reel slot by Rival.